A very common name in the world of heart problems is a Heart Attack also known as (coronary thrombosis or myocardial infarction). We come across this problem when one of the coronary arteries is completely blocked. In this condition one part of heart muscle starts suffering with oxygen deficiency. 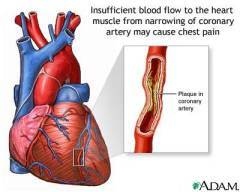 Usually the cause of this condition is a blood clot produced in any coronary artery. The major cause of the heart attack is a clot of a blood which usually blocks one of the heart blood supply vessels called coronary arteries (they are responsible of supplying oxygen rich blood to the heart muscles). The common cause of the occurrence of this clot is contraction of coronary artery due to a condition called atherosclerosis. The atherosclerotic plaque in the inner walls of coronary artery sometimes cracks and results in the generation of a clot known as thrombus. This blood clot in the coronary artery intrudes the blood supply to the specific parts of the heart muscles causing their death because of stopping the oxygen supply to them. Now the dead heath muscles can not contract and the other heart muscles having full energy ought to balance the pressure. The first hour of this blockage condition is usually enormously painful. Patient having this condition feels a crushing sensation in the middle of the chest and can also feel the pain and heaviness in neck, jaw and arms. Other symptoms reported along this condition are sweating, nausea and/ or breathlessness. And here in the case of heart attack these problems last much longer than in angina attack. The chest pain at the back of the sternum (breastbone) is also a big symptom of the heart attack. In many cases it is also noticed that the pain was very light or close to absence. This situation is known as “Silent Heart Attack”. This Silent Attack often occurs in older ages and diabetic patients. In the painful cases the pain usually emits from chest to arms, shoulder, neck, teeth or jaw, abdomen or back. But in some cases the pain is recorded only in either one of these body parts. A heavy pressure on the chest or squeezing like condition. A binding around the chest with a tight band like condition. A very heavy weight like any big animal like elephant is sitting on the chest like condition. A condition of light dizziness. In case of persistent blockage of the coronary artery the suffered part makes a scar which leads to permanent damage. Now it depends on the location of the scar that the heart gets weaker in its pumping or there will be no significant problem. The heart can be rather uncomfortably beating along with variable heart rate in immediate after heart attack. So due to this risky factor a complete observation and pampering in any health care environment is essentially required in these days. When that scar fully vanishes the heart becomes stable and then being in that observation is not that necessary. When there is speedy healing most people with simple heart attack lead their rest of the life like other normal human beings. Weightiness and pressure in the middle of the chest which may emerge to arms, neck, jaw, face, back or stomach. Unease or pain alike in angina but sometimes it is intense. The problem of angina often occurs when doing any physical activity or due to emotional stress. Heart Attack can occur at anytime even at rest state. The symptoms most of the time disappear within 10-15 minutes. In case of symptoms persisting more than 15 minutes, its likely to be a heart attack. Can get rid of the symptoms by resting or using nitrate medicines. Symptoms persist even after rest or taking any nitrates.